Confession time. 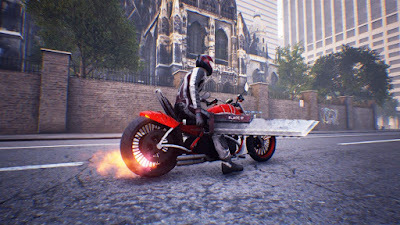 When an email (with a surprisingly decent looking launch trailer) about Road Rage showed up in my inbox I thought it was some lovingly crafted indie Kickstarted homage to Road Rash or something similar so I requested a copy. 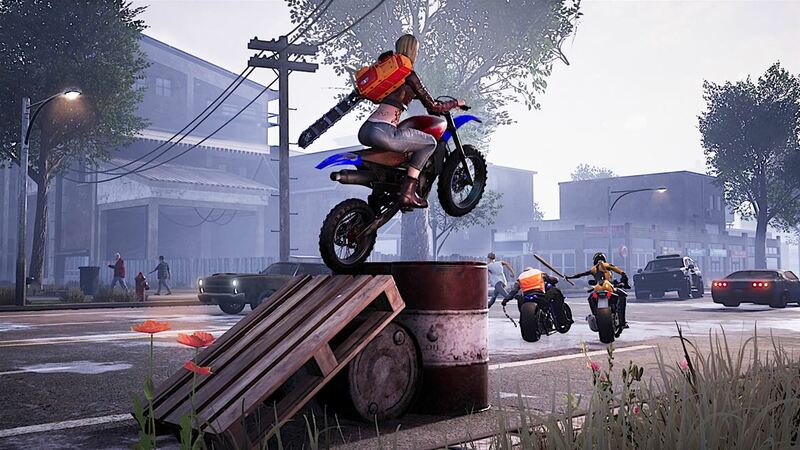 If I had known it was an ugly, buggy, laggy, terrible playing mess – that happened to feature vaguely familiar motorcycle melee combat – I wouldn’t have bothered. Road Rage is just plain awful. Continue reading our full PS4 Road Rage review for all of the details. A dystopian future city where giant walls separate the social classes and motorcycle gangs roam the streets is your playground in Road Rage. By winning races and doing, uh, stuff, your gang will somehow clean up the cesspool of a city and bring justice back to the masses. I guess? It doesn’t matter. The story doesn’t matter because pretty much everything about the game is awful. Gameplay-wise it starts off fairly straightforward. Right trigger accelerates, left trigger brakes, and left analog stick turns. Strangely, the controls are incredibly twitchy and oversensitive except when you actually need to go around a corner, at which point the bikes understeer like crazy. Using melee attacks against other riders is a crapshoot as there is 1. a delay when you press the buttons, 2. your attacks miss more often than not regardless of your positioning, and 3. the attacks aren’t satisfying feeling in the least. The whole point of the game is the brutal melee combat while tearing around on a motorcycle and they totally blew it. What makes the thoroughly mediocre gameplay even worse is that the A.I. is terrible and the game is full of glitches. The A.I. doesn’t seem finished, honestly. They never pose much of a threat to actually beat you in a race and routinely get stuck on objects or can’t make turns so you easily drive away and win. Of course, the game is also full of glitches, too, so even if the A.I. can’t beat you in a fair fight you’ll still lose surprisingly often because the game just freaks out. We fell through the world, we got bumped by invisible objects that made us take the wrong path and instantly lose, the game respawned us after crashes behind fences or other impassable objects, we crashed for no reason, we exploded for no reason, we got stuck on level geometry … the list goes on and on. And if you can avoid glitches and fight the clunky gameplay to keep your bike on the road, the game is then way way too easy and boring. Road Rage is just terrible. The one positive about Road Rage is that it has a fairly decent amount of content. The open world map is large and there are lots of events and do. There is also fairly extensive customization with a ton of different bikes to choose from, all of which can be upgraded and customized, and a bunch of different weapons. Of course, you have to fight laggy slow menus to actually do anything, but it’s commendable that there’s so much content here. Too bad the gameplay is so poor no one will want to see most of it. Visually, Road Rage is lackluster at best and ugly at worst. Bland environmental textures and bad character models with incredibly stiff and stilted animation are about all Road Rage has to offer. The game also utilizes level obscuring fog to an extent we haven’t seen since the PS2 days to cover up what, we can only assume, must be ridiculous pop-in. Add in monotone engine noises and the worst collection of license-free buttrock music you can find and Road Rage’s mediocre presentation is complete. Road Rage is a total mess from top to bottom. With bad presentation, terrible controls, bad A.I., and overwhelmingly glitchy gameplay, it is one of the worst games of 2017. Road Rage isn’t worth $3, and definitely not it’s $30 MSRP. Skip it. Forget it exists.